Producer No I.D. - whose real name is Dion Wilson - revealed that the rapper's wife listened to every song on the album before it made the final cut and gave her advice. He told the New York Times: "I always call Bey our de facto A&R. Pillow talk is the strongest conversation on the planet. Every song has to get past her ears, in my eyes. She came by a lot and played a good part in helping us get over hurdles on certain records. Of course she's genius-level with that." Jay-Z's title track from '4:44', features an apology from the star - who has kids Blue Ivy, five, and newborn twins with his singer spouse - to his wife, and is believed to be a direct reference back to the claims she hinted to him being unfaithful with "Becky with the good hair" on her visual LP 'Lemonade'. He rapped: "If my children knew, I don't even know what I would do. If they ain't look at me the same, I would probably die with all the shame. "You did what with who? What good is a ménage a trois when you have a soulmate, you risked that for Blue? "I apologize, often womanize, took my child to be born, see through a woman's eyes. "Took for these natural twins to believe in miracles. Took me too long for this song. I don't deserve you." And in the song 'Family Feud' - which features vocals from Beyoncé - he included the line: "Yeah, I'll f**k up a good thing if you let me, let me alone Becky." 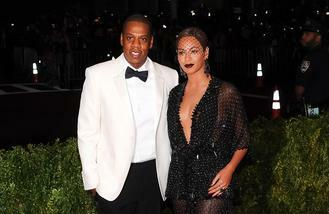 In another track, the rapper - whose real name is Shawn Carter - made comment on the infamous Met Gala 2014 row which saw him attacked in a lift by sister-in-law Solange Knowles. Referring to Halle Berry's unfaithful ex-husband Eric Benet, he rapped in 'Kill Jay Z': "You egged Solange on, knowing all along all you had to say you was wrong. "You almost went Eric Benet, let the baddest girl in the world get away." However, when asked if they spoke about 'Lemonade' while making Jay-Z's latest record, No I.D. insisted they "never directly spoke about that album". He explained: "Mainly because if he talks about himself, it's going to bleed into that regardless. But there's a difference in talking about it for the sake of response and for the sake of honesty and the truth. The truth needs to explain why you are the way you are, why you did what you did. We know what happened. We got it. But what were the circumstances that led to this and how do you feel about it?"